Cut Times are used to subdivide an event into two or more categories based on cut-off times. If two categories are needed then one cut time is listed with the two categories being made up of those faster than or equal to the time and those slower than the time. This is referred to as an A Meet with categories A and B. If three categories are needed then two cut times are listed with the three categories being made up of those faster than the fastest time, those between the two times and those slower than the slowest time. This is referred to as an A-B Meet with categories A, B and C.
The progression continues for four category meets and beyond. Multi-age cuts are supported but MIXED ARE NOT. Prelim/Finals meets will only support standards, not cuts. 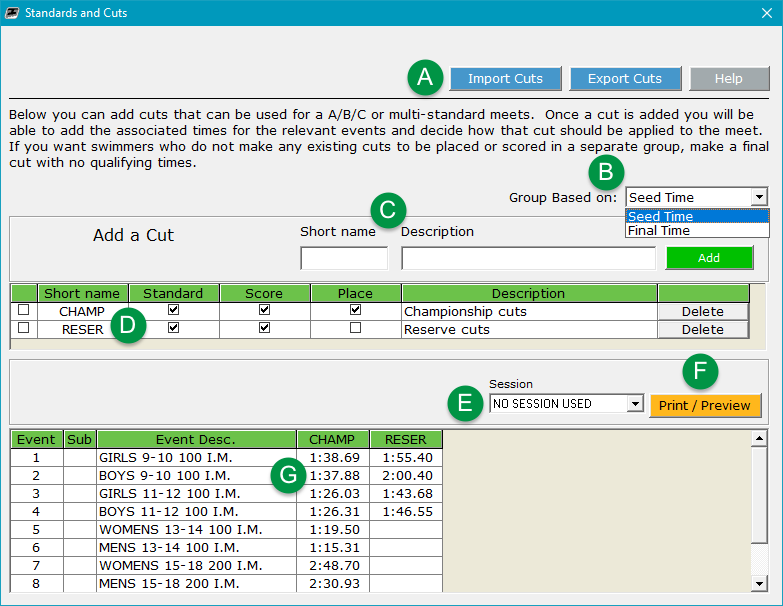 Access the screen to view and enter cuts via Events, then click Event Cut Times on the right. Import Cuts - Click to import cuts either one at a time in the old text file format, or as a group in the new XML format. Next navigate to the cut file, select it, click Open, and it will be imported into the grids below. Export Cuts - To export cuts in XML format, check the box to the left of the desired cut(s) in the top grid (D), click Export Cuts, choose where the cuts file will be saved, name it, and click Save. Group athletes in results by how their Seed Time or Final Time compares against the cut time(s). You will also see the NONE group within the results if the athletes do not fall into any of the listed cuts. In the above example this will be the case because the "C" cut is not selected. To add a new cut, enter the Short name (up to 5 characters such as A or BB), Description (appears in the key when printing results but is optional) and click Add. That creates an entry in the top grid (D) with the new cut (click the name under the Description column to rename it) and a column in the grid below (G) where you will enter the cut times for each event in your meet (at least the ones that have a cut time). Enter each cut by typing digits only, with the last digit in the hundredth place, such as 14382 for 1:43.82. TouchPad adds the punctuation automatically. Next decide how that cut should be applied to the meet with the three checkboxes by it in the upper grid (D). If you want swimmers who do not make any existing cuts to be placed or scored in a separate group, then make a final cut with no qualifying times and you will see them listed under that group instead of NONE. 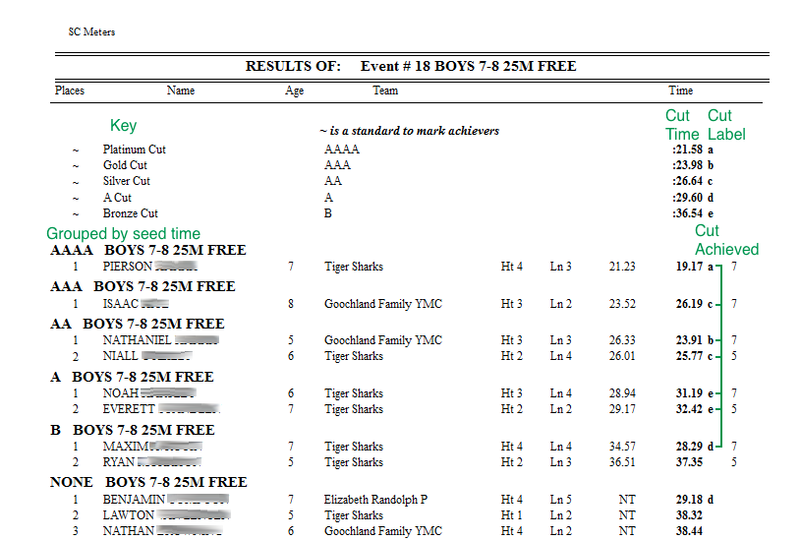 Standard - When checked, a letter representing this cut will be displayed next to the swimmers’ results if they achieve it. Score - When checked, this cut will be allowed to score. You must check Place in order to check Score. Place - When checked, this cut will be allowed to create award labels. Note if you check Place by any cut times, you cannot use the Restricted Scoring, First Heat Scoring, Last Heat Scoring or Multiple Division Scoring. Also, you may only use these cuts on a Timed Final Meet (where each event is contested just ONCE). Optionally display only events for a selected session. Click Print/Preview to preview and print the entire cuts table. If there are more than six cuts (vertical columns), each set of six will appear in a separate printout. Make sure to check the Cut Times checkbox to include them in any report. If you change the Group Based on setting after scoring and want to print results or award labels from the Meet Results screen, you will need to re-score first. When printing from Enter Results, there is no need to re-score since it scores each time you print.